Named in honor of alumna Corrinne Remschel (class of 1931), Remschel Hall was dedicated on September 24, 1993. The large lobby is open to the second floor walk-way and is dedicated to the memory of Gene Daniel Skeen, an alumna of 1923. This four-story building houses 114 female residents and is centrally located on the quad putting it within easy walking distance to the dining hall, Crusader Café located in Mabee Student Center, the library, Mayborn Campus Center and all academic buildings. This facility includes two lobby areas, study rooms on the first and second floors, a computer lab, two T.V. areas, vending machines, a large central laundry room where laundry can be done free of charge, and an elevator. 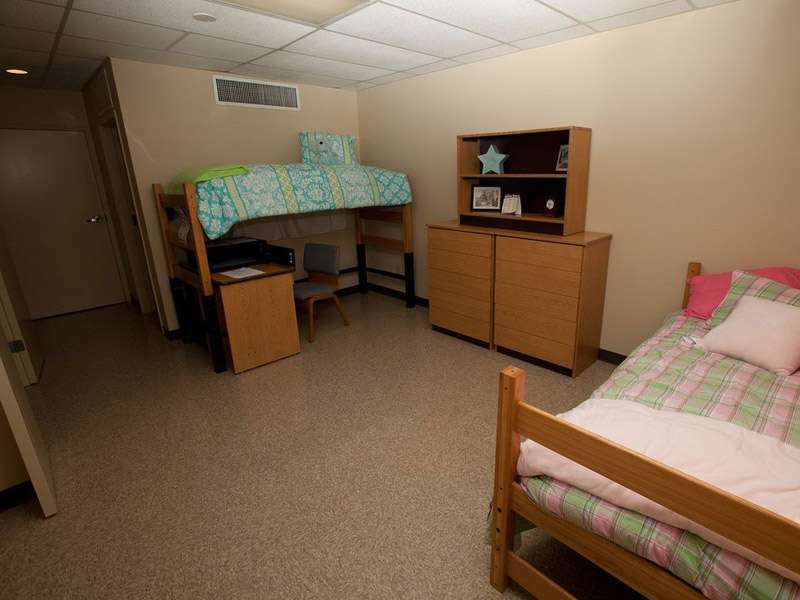 Resident Assistants are assigned to each floor of the building and the Resident Director lives on-site. Building security includes a staff member on duty each evening until closing and a card access system for entry into the building after doors are locked. Approximate room dimensions are 13' x 21' (273 sq. ft.). Shared rooms come equipped with two twin beds with 80" mattresses, two desks, two desk chairs, and two chest of drawers. Each resident has her own closet space. Wireless internet in building and two internet jacks per room. Cable and internet service are provided. View UMHB Channel Guide. The private bath is approximately 7' x 6' and has a shower and a large vanity area. One micro-fridge is included in each room. Walls are a neutral tone and are sheetrock. Students must check with the hall staff before hanging anything on walls or other surfaces within the room. All furnishings are moveable and the beds can be bunked.